I’ve been blogging for a little over 2 years now and being a blogger does mean a lot to me, it’s become an intrinsic part of me and my identity. With my gradual wind down towards baby girl’s arrival, alongside a lot of sleepless nights, I’ve had some time to think about my blog, being a blogger and what I want from it moving forward. I’m not in the big leagues, I am a very small fish in a very large ocean but I am proud of what I produce. I love writing and I will only publish posts that I think deserve publishing. Don’t get me wrong, I don’t believe that everything I write is of such fine literary standards that I deserve to win any awards, however alongside the day to day family snapshots, I write content that makes me proud of what I do. From silent reflux and raising a high need child, to current affairs and letters from the heart, I put a lot into my writing and it’s something I’ve been passionate about since childhood. At times, being a blogger had frustrated the heck out of me and I’ve wondered whether to bother with it all. I’ve seen slow but steady growth in my readership and I’ll admit that there have been times that I’ve seen blogs with ten times the traffic I’ve got, yet whose actual writing doesn’t seem to have any passion behind it. That bugs me, I won’t lie. I’ve often wondered why, even when I follow all of the ‘How To Grow Your Blog’ tips, mine just doesn’t take off in a big way, but then I remind myself why I do it. I am at no risk of ever going viral with a post, even ones I think deserve to! But two years ago, I didn’t start this blog with that intention, I started because I was wondering pregnant with our first baby and wanted to document it. My style may have changed along the way, I may now also do product reviews and I may now also write about many other topics alongside my own family life, but that intrinsic purpose behind my blog’s existence remains the same: To capture my family’s life as our children blossom and grow. I called my blog Budding Smiles because to me it represented my wishes for my family. Buds are delicate and beautiful, they hold the joy of life and beauty. Likewise, to be a ‘budding’ something is to show promise and I want my children to be born as beautiful buds with the promise of futures full of smiles and happiness. I know, pass the bucket and all that but it’s true! I didn’t call my blog ‘Budding High Flyer’ because, well it sounds stupid, but it’s not what Budding Smiles is about. Being a blogger has given me opportunities, experiences and friendships that I never would have expected and for that I am so very grateful. I’ve worked with wonderful brands and PRs, been to fantastic events and received amazing products to review. I’ve made some of my closest friends and I have my family’s story in one place to always look back upon. It’s awards season in the blogging world and I’ve cast my votes for both the MADs and the BiBs. As much as I would love the idea of being even nominated, I know that my blog doesn’t reach people the same way others do and I’m okay with that! So instead, I’m thinking about the bloggers whose writing captures my soul, whose photography brings brightness to my day and whose words inspire me. Being a blogger is a huge part of who I am and I love it. This blog holds the stories of two pregnancies, currently one birth (keep your eyes peeled for the second one! ), celebrations, holidays, special moments and also difficulties that we’ve faced. I often get emails from parents of silent reflux or high need babies thanking me for being so open. I may not reach tens of thousands of people through my writing, but if I reach those who need it then I’ve made a difference. If not, well then at least I’ll have a nice memory book to print for myself and my family when the time comes to pack it all in! I’m just going to keep doing what I do until either my kids ask me to take the site down or I stop loving my blog. It’s that simple! Are you a blogger? What does it mean to you? If you’re not, what makes you want to keep reading a blog? Let me know in the comments below or get in touch on Facebook or Twitter. I’ve been blogging for 4 years now but its only been recently that I’ve started to take it a lot more seriously. I’ve always loved writing so blogging for me is a creative outlet but I’ve also had the chance to have some amazing products, meals out etc. Beautifully put, Hannah. I think it’s good sometimes to stop and remind ourselves why we blog and how much we’ve achieved along the way. Stats aren’t everything, of course. I’ve never followed a blog because they are ‘popular’ or have a high Tots ranking or whatever. They’re easier to find, yes, but most of my favourites are relatively small and I follow them because I enjoy how they write as much as what they write about. The biggest plus for me from blogging, aside from scratching my own creative itch, has been the number of people and subjects it has brought me into contact with who I would never otherwise have discovered. I wouldn’t know as much about Down’s syndrome or autism or the challenges facing stay-at-home dads and mums struggling to return to the workplace. And I wouldn’t know you (and the rest of the Meet the Parents podcast crew)! There’s no questioning your abilities as a writer or the combination of thoughtfulness and passion that shines through in everything you write. A pleasure, as always. I can’t imagine how hard it must be to keep a blog going if you don’t love what you’re writing and why. That passion is what really sets them apart. Every year the awards roll around, and most years I’m not entirely fussed about them. This year I want nominations. I want to be recognised. I’ve no idea what has changed compared to previous years though, so it’s a odd feeling. Ultimately everyone should write their blog for their own reasons. not for acclaim from their peers. Thankfully I still enjoy writing on it. I think that will always be the main thing. I’m still very new to blogging but I know I will never have a viral post or win an award because my blog was started as a record of my grandson. I love writing it and choosing the photo’s. I know at least these few photo’s will be viewed rather than just sit on my phone or on my computer. What I have found is a really friendly and supportive group of people, bloggers. Great post. Good luck with finding a sponsor, I’ve been to two Britmums and loved them. Being a blogger means so many different things to different people. To me it helped me realise that I can write and gave me the confidence to go on to university to start studying the degree I am currently taking. Yes to all of this Hannah! I started in exactly the same way — I was 17 weeks pregnant and wanted to chart my thoughts and feelings, then the twins’ milestones as they grew. Now, I take about other things too — and reveiw items along the way — but my blog is fundamentally the same. I absolutely love it and can’t imagine it not being part of my (or my family’s) life any time soon! First of all, what a cute little family you have! Im a photographer, so the first thing i notice is the photos :). Im very new to blogging, i started my blog 2 years ago just a place where i could share our changing lifestyle, recipes etc with family and friends, I didn’t do much with it till this past year so im kind of in a transition phase, my blog needs major make over, awards i dont even think about but maybe one day i will. 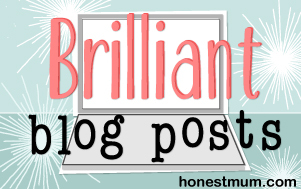 I love reading blogs and finding new ones that are hidden away because some really great ones can be hard to find. Love your blog, being able to feel the honesty and that its from the heart is what i love the best. What a wonderful post. I can’t think of anything else to say but that! Just lovely. I haven’t cast my votes in the MADs and BiBs yet. I always do it in the final week so I have plenty of time to consider the options! Nice post. Why we blog evolves over time but you’re right – there’s no harm in reminding ourselves of our roots and original thinking. I blog because I love writing, and I love to write nonsense. Hi! I'm Hannah, a 30-year-old wife to Phil and Mummy to Toby - born July 2014, and Martha - born May 2016. I love music, reading, travelling and my gorgeous life with Phil, Toby and Martha in the countryside. We live in a cottage with our cat Ivy and the sounds of hundreds of birds overhead.